At least 10 hectares of land within Poblacion, Mankayan have been declared a danger zone or “critical area” and all structures therein must be relocated immediately due to ground subsidence and in wake of a huge landslide last June 5. This was the latest recommendation of the regional Mines and Geosciences Bureau (MGB) of the Department of Environment and Natural Resources following the conduct of a survey in areas previously delineated as geo-hazard sites in the mineral-rich town. A portion of the 10-hectare critical area is where a church and seven buildings of the Mankayan National High School are currently situated while a portion occupied by three more school buildings are covered by the critical area. The site of the Mankayan Elementary School has been labeled as a “high hazard” area, which means that a new structure should be built there. MGB director Engr. Samuel Paragas said that his office highly recommends to the local government of Mankayan to cause the immediate relocation of all structures in the area labeled as a critical site and have the area utilized as an open space or tree park. But Paragas acknowledged that the recommendation for an immediate relocation of public and private structures to safer ground would entail huge resources, which will require intervention from the national government like the National Disaster Coordinating Council. He said that the call or request for the municipal government of Mankayan to relocate public and private structures from Poblacion to Barangay Bulalacao can be traced back to the ’50s but such call never materialized up to now. MGB experts like Engrs. Benjie Espejo and Felizardo Gacad also said that based on the latest geo-hazard survey and assessment within Poblacion, Mankayan, there are a number of households and business establishments in the areas delineated as “high hazard” sites. The agency recommended that the relocation of residents within the “high hazard” area should be considered as a long-term solution and no construction of new public and private structures should be allowed by the local government. A number of studies and surveys were conducted by different groups including the MGB over the geo-hazard area since the ’70s but there is no definite conclusion that Lepanto Mines’ underground tunnel aggravated the ground subsidence that caused a huge landslide. To dispel the supposed bias in the results of the previous studies, President Gloria Arroyo has been requested to order a conduct of an independent geological study over the ground subsidence and huge landslide in Mankayan. it seems not only the school is in trouble but the entire town..
agasem man no iapan da jy bulalacao t eskwelaan...so no relocation t kailangan ket jy agbiruk ngarud t mayat nga relocation site t next goal?...i like the idea of relocating to the golf area, tapno lumaing met studyante t mankayan t golf a..hehe..maisukat t baseball/softball ta awanen pagpraktisan piman t studyante...ngem no ngata jy sinking area t irelocate dan..haha..joke lng po..
no haan u pai nabasa, daytoy t damag d napalabas nga domingo. The principal of the Mankayan National High School (MNHS) told the provincial board last week that the school was set to evacuate the school grounds at the first hint of imminent danger. “If worse comes to worst, we have arranged for the Lepanto high schools to accommodate our students and pupils,” said Pablo Khayog, principal of the MNHS. He said that once the plan is implemented, Mankayan schools will use the Lepanto school buildings from 6:30 a.m. to 12:30 p.m with Lepanto students using the remainder of the day for their classes. He conceded that the plan would be an additional burden to the pa-rents of the students and pupils. 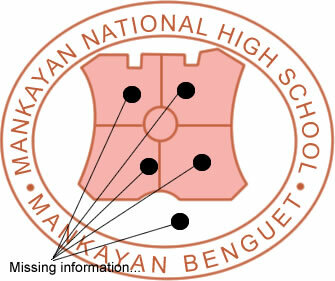 The Mankayan schools have 720 high school students and 600 pupils in the elementary grades. Khayog said the Mankayan school grounds are located inside a hazardous area and is near a critical one. He said some pupils have been relocated in nearby buildings. “Some students have transferred elsewhere but the majority are staying,” he said. Mankayan municipal officials led by Manalo Galuten and Paterno Dacanay assured the board that they are currently on the look-out for an area to relocate the school. They said several possible sites have been pinpointed all in Barangay Poblacion. They added that they were banking on assistance from the national government to provide the funds in purchasing a relocation site since the municipality does not have enough funds. At the same time, the municipal officials said they were set to engage the services of independent geologists to get at the bottom of the Mankayan sinking. They said that Lepanto Mines has denied that it was mining that caused the area to sink but that they also believed otherwise. The provincial board, chaired by vice governor Cresencio Pacalso, indicated that the provincial government can provide assistance to the municipality from the five percent calamity fund. Board member Florence Tingbaoen pressed the immediate evacuation of the school grounds while board member Johnny Uy urged local officials “not to wait for worse to become worst” before acting on the situation. Galuten said a ground subsidence that struck Barangay Colalo more than 10 years ago collapsed several school buildings and led to the death of one resident whose body was never found. Mankayan officials estimated that the cost for relocating the schools would amount to a total of P83 million or even more. Shocks bat nagkaganoon ang MNHS?